Work from Kang‘s exhibition at Erin Stump Projects. 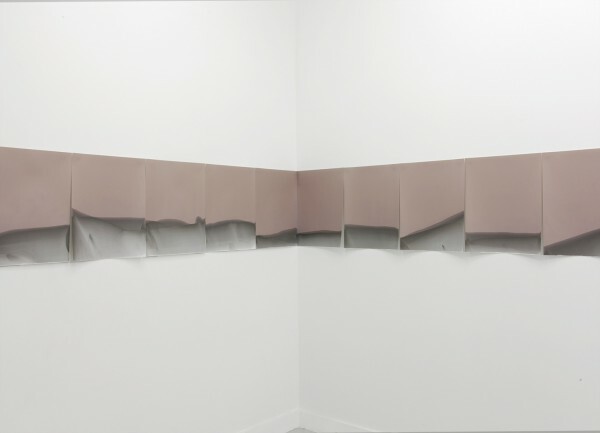 Art has always been defined by its internal and external context, and in Laurie Kang’s new solo exhibition at Erin Stump Projects her gesture is to re-consider the power structure of the gallery space through the deconstruction of the art objects on display. An artwork’s traditional role as the center of meaning is subservient in this exhibition to the social structure of the white cube. 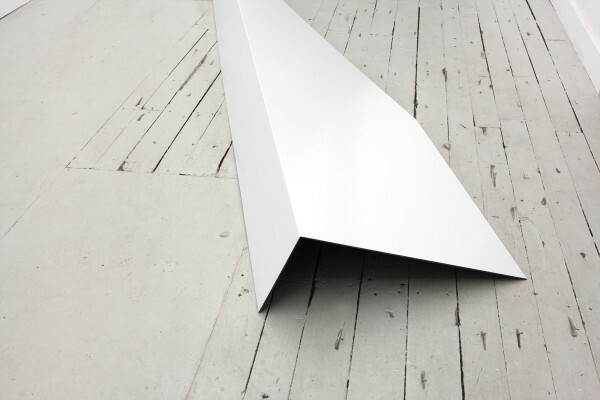 This inversion of the classic hierarchy is made through an installation created specifically for the gallery’s location at 1086 1/2 Queen Street West. Along the perimeter of the exhibition space hang the contents of one box of Ilford Multigrade IV RC Deluxe silver halide photo paper. All fifty pages are empty except for the subtle trace of an action: the entire stack has been dipped into liquid fixer. 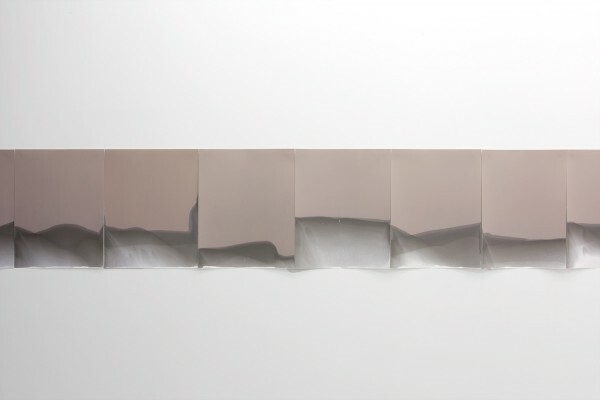 Similar to how an object is taken from an artist’s studio and submerged into a public gallery, anointing it as a viable work of art, Kang’s gesture reflects this process. Art is elected through consensus, and the public’s agreement that certain spaces should promote systems which justify the significance of objects or gestures is a social process that relies upon predefinition. The consistency of each of Kang’s pages bearing the mark of the chemical fixer reflects this agreement. The gallery is a place of record, and the individual pieces of paper are bound to the wall like pages in the spine of a book. Displaying the blank pages in a predefined context recalls Vancouver-based artists Tim Lee and Mark Soo’s book Modern Optical Experiments in Typography: Univers Ultra Light Oblique (1968), where one thousand and twenty-four pages are left blank except for four words on four separate pages. Is it a book simply because it is a bound collection of pages with a colour cover? 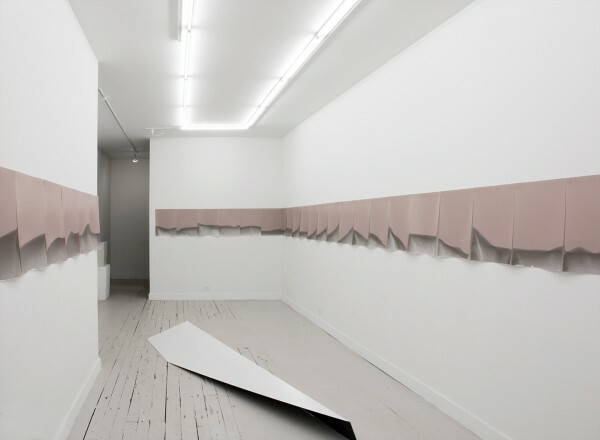 The internal logic of Kang’s pages displayed in the gallery imitate the deconstructionist theory of a fragmented text, which “prevent their ever becoming works by exposing their central knot of indeterminacy”. Are they examples of artwork, or artworks themselves? To extend the tautology of her exhibition, Kang presents a 1:1 scale replica of the front step of the gallery inside as a sculpture. Outside, its original form is a long triangular wedge of concrete that stretches underneath the front door and the large front window next to it. Inside, the silhouette of the step sits in the centre of the room unobtrusively, a form to be navigated around as the viewer walks along the wall. Are we meant to disregard it in the same way we do the original? Martin, Wallace. “Introduction.” The Yale Critics: Deconstruction in America. Minneapolis: University of Minnesota, 1983. Greetham, D.C. “[Textual] Criticism and Deconstruction.” Studies in Bibliography, Vol. 44. Virginia: University of Virginia, 1991.
 de Man, Paul. “Shelley Disfigured.” Deconstruction and Criticism. New York: Continuum, 1979. The entry 'Laurie Kang' was posted on April 25th, 2013 at 10:25 pm	and last modified on April 25th, 2013 at 11:30 pm, and is filed under Uncategorized. You can follow any responses to this entry through the RSS 2.0 feed. Both comments and pings are currently closed.